Hanyang University’s spring festival Rachios started on the 23rdof May, Wednesday. The main square of the campus was filled with booths of the university’s major departments and clubs. Out of all of them, the booth of Division of International studies booth captured everyone’s attention with an outside karaoke with snacks such as sherbets and a Korean traditional sugar cookie, ‘dal-go-na’. During the nighttime, famous singers such as Yun dan dan, 10cm and Yun ha filled up the stage. 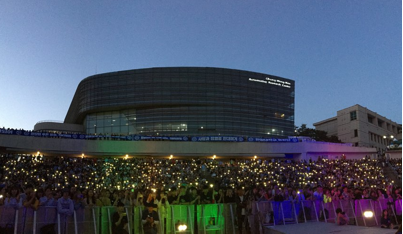 While they performed their hit songs, the audience responded by singing along and filling the seats with lights, creating a spectacle view of a wave of lights. The cheering performance of Hayang University’s cheer leading group ‘Rhooters’ also added the heat and brought all students together, adding a bonding experience for Hanyang University students. Also, cheerleading groups from other schools came to the festival to congratulate the first day of Rachios. This was the first time for Hanyang University to host a festival without any alcohol involved. However, because of this reason the festival was more focused on the variety of things to do and festive events. And thanks to all of these attractions, events and performances, the 2018 Hanyang spring festival Rachios kicked with a great start.